Grapes contracted – Cabernet Sauvignon, Syrah, Grenache, Mouvedre, Tempranillo, Malbec, Viognier, Chardonnay, Morio Muscat, Aligote, Orange Muscat,Tinto Cao, Tinta Madiera, Touriga National, Souzou. 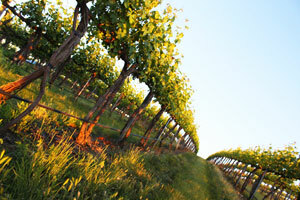 Over the years, Upland vineyard has become a prized jewel and dominate vineyard in our portfolio of wines. Producing 14 vineyard designated wines and encompassing many of our blends this vineyard site is Robert O. Smasne’s dream vineyard. Its versatile growing conditions, generous heat units and unique terroir are showcased in the 35 varieties of viniferous that are grown. Located in the heart of Washington wine country, the Yakima Valley, the vineyard is the star of the Snipes Mountain American Viticultural Area. Farming wine grapes since 1968, four generations of Newhouse family farming have helped maintain the Upland legacy, which started over 90 years ago. Originally planted by William B. Bridgman in 1917, Snipes Mountain is widely considered the birth place of Washington Wine. Today that original vineyard is still bearing fruit and the vine&rsquo;s longevity is a testament to the favorable weather conditions bestowed upon the mountain. With slopes facing in all four cardinal directions and an elevation that ranges from 750 to 1300 feet, Upland is able to grow a wide range of wine grapes in some of the oldest and most diverse soils in Washington. Our designated rows in this remarkable vineyard setting along with this talented wine growing family produce some of the highest quality grapes in the world. Located in the Horse Heaven Hills, the 1100+ acre vineyard sits high above the Yakima Valley and a short distance from the majestic Columbia River. Planted in 1996, we have designated rows within specific blocks of Cabernet Sauvignon, Syrah and Merlot.. With heat units as high as Red Mountain, diverse soils, wind and river influences it is a vineyard that captures the essence of terroir. Coyote Canyon fruit brings ripe, refined tannins, classical varietal character, intensity and concentration to our red wine blends. In 1998, Robert O. Smasne was the first winemaker to source fruit from the Phinny Hill Vineyard. Producing three vineyard designated single varietal Bordeaux wines and playing a major role in the Robert O. Smasne, Owens Reserve. This vineyard is a prized part of our vineyard portfolio. Located on top of a hill on the western section of the Horse Heaven Hills, the ancestral gravel filled soils from the Blue Mountains, generous heat units and long growing season make this vineyard the pinnacle of quality for our designated blocks of Carmenere, Malbec and Petit Verdot. We love the finesse, complexity and ripe tannins it imparts in our wines. Located just south of Union Gap, on the western end of the Yakima Valley, this vineyard is a secret gem in our portfolio of vineyards. Our dedicated rows of Malbec from this cooler site produce grapes that are small, thicker skinned and loaded with flavors. These expressive and lush Malbec’s add bright fruit and suppleness to our blends.